Tom Rodgers leads the McKesson Venture Fund, which focuses on helping build businesses that will drive toward a stronger, more sustainable future for the health care industry. Target investments span a broad section of the health care industry with a focus on opportunities created by emerging trends in consumerism, alternative delivery models, shift toward value-based payments, and analytics. 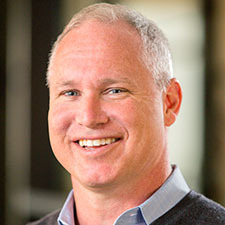 Prior to rejoining McKesson, he spent a decade in health care venture capital, most recently leading strategic investing effort for Cambia Health and before that with Advanced Technology Ventures. His investments include Aperio (sold to Danaher), Helixis (sold to Illumina), Zeltiq (Nasdaq: ZLTQ), and more recently Accolade, PipeLineRx, Evariant, Carena, and ClearCare on behalf of McKesson. Before his venture career, Tom had significant operating experience in the health care industry including various strategy and commercial roles at leading technology companies such as McKesson, Genentech, FitLinxx, and The Wilkerson Group. Tom holds a master’s degree in business administration from the Wharton School and a bachelor’s degree from the University of Pennsylvania.